For marinade, place first five ingredients in a blender. Cut four tomatoes into quarters and add to blender; cover and process until blended. Halve remaining tomatoes for grilling. In a bowl, combine chicken and 2/3 cup marinade; refrigerate, covered, 1 hour, turning occasionally. Reserve remaining marinade for serving. 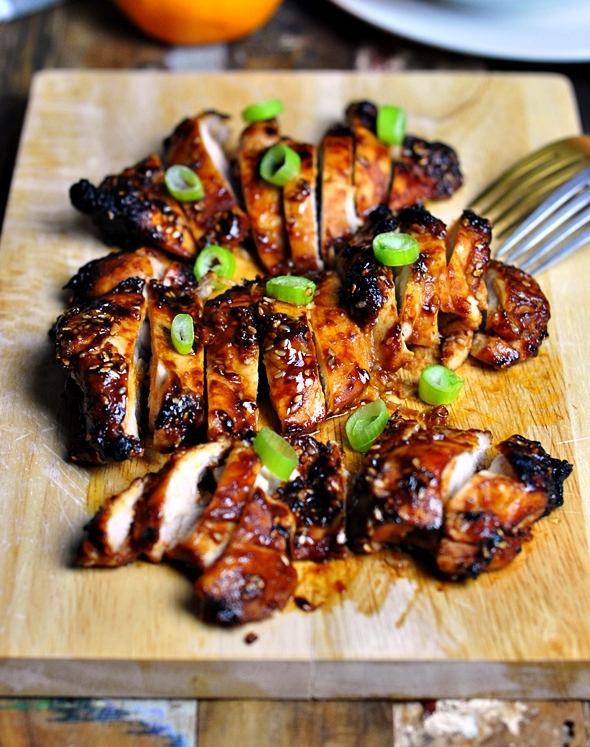 Place chicken on an oiled grill rack over medium heat; discard marinade remaining in bowl. Grill chicken, covered, until a thermometer reads 165°, 4-6 minutes per side. Grill tomatoes, covered, over medium heat until lightly browned, 2-4 minutes per side. Serve chicken and tomatoes with reserved marinade. 1 serving: 177 calories, 5g fat (1g saturated fat), 63mg cholesterol, 171mg sodium, 8g carbohydrate (7g sugars, 1g fiber), 24g protein. Diabetic Exchanges: 3 lean meat, 1 vegetable, 1/2 fat.